Our highly qualified independent surveyors will offer you advice on your property problems and can carry out a building survey on your prospective purchase; whether it is residential or for business. We can prepare a schedule of condition and property report in relation to your lease. We carry out dilaps reports for landlords or tenants. We recommend you look at our sample surveys http://www.1stassociated.co.uk/media.asp to see examples of our surveys. We are Chartered Building Surveyors carrying out structural surveys on properties and today was the second consecutive day when Japanese Knotweed had been pointed out as a problem by the mortgage company and it was only Thursday, and Japanese Knotweed had been a problem at a property only the week before. 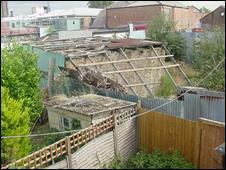 This could be described as a new and interesting property problem but is certainly not interesting if you are the owner of the house who is trying to sell it with Japanese Knotweed and it is certainly not new as it is said that Japanese Knotweed has been in this country for quite a number of years. Over the past 10 years or so there has been a grand swell of knowledge and information coming to Chartered Surveyors, Chartered Building Surveyors and Chartered Valuation Surveyors on Japanese Knotweed. We recall it first at a continued professional development course approximately about 10 years ago when it had the briefest mention. Continued professional development courses are ongoing courses of knowledge that every Chartered Surveyor has to carry out and, if I recall correctly, it was just very briefly mentioned in a lecture on trees. Since then it has tended to get a bigger and bigger mention and we have even been to one continued professional development course where the same Surveyor has twice recounted his story about the problems with it and he wasn’t even giving the lecture, he was just an audience member. This is all very interesting when training to be a Chartered Surveyor I managed to have approximately 7 years of training without Japanese Knotweed being mentioned once! 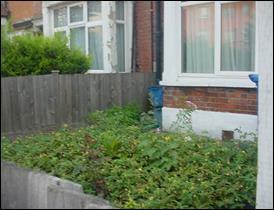 SO WHAT DOES JAPANESE KNOTWEED LOOK LIKE? Here are a number of pictures of Japanese Knotweed, we have made them a lot larger than we normally do in our articles so hopefully you can use if for identification purposes. In our personal experience of dealing with a case of Japanese Knotweed for approximately 7 years (and it still hasn’t been eradicated fully), is that it spreads fairly quickly, lots of people think it looks quite nice but once it gets a stronghold it spreads very, very quickly. It can appear to spread quickly if it has taken a stronghold in adjoining ground and it can ultimately affect the stability of the property. Japanese Knotweed knits together almost like a web of roots, with green teardrop shaped leaves with round stems, which become almost wood like in the main part of the Japanese Knotweed. 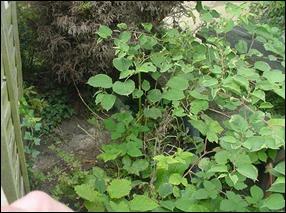 Here are some more photos of Japanese Knotweed. It is important to be able to recognise it. 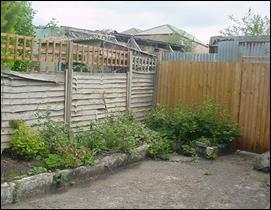 Japanese Knotweed occurs both on new properties, although in theory the developers are meant to clear the ground of it and protect against it, it and also appears in older properties. We have dealt with cases in both instances. The problem is that it stops the mortgage application dead and the bigger problem is that more and more Chartered Surveyors and Chartered Valuation Surveyors are going on specialist courses on it, so it is very recognisable and it gets spotted a lot more often than it used to be. WHAT CAN I DO ABOUT JAPANESE KNOTWEED? You need to start by identifying that you have definitely got it, which is why we have placed photos within this article. 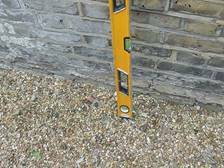 There are many specialists appearing with regard to removing it but we have to be very careful with specialists as lots of them, such as damp proof specialists and woodworm treatment specialists, are from an industry where the surveyors are just part of the selling mechanism. Therefore it is important to make sure you have an Independent Chartered Surveyor’s advice and we would recommend to treat as quickly as possible. The nice thing about having a company carry out the removal of Japanese Knotweed is that you will have at the end a certificate saying that it has been eradicated and they will tend to get easier access into the neighbouring gardens than perhaps you may, with the neighbour not wanting you to see their garden or inside their house etc. 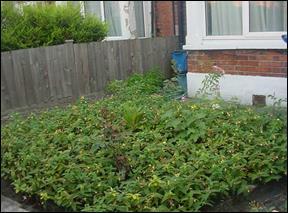 Give us a phone call on 0800 298 5424 to discuss Japanese Knotweed. There is a whole lot more we can say about Japanese Knotweed, but the first step forward is to be able to recognise it and carry out your own inspection. Just for the record, those Chartered Surveyors who have heard that we are growing our own Japanese Knotweed to understand the problems better, this is not true, we are simply monitoring the examples that other people have as there is more than enough Japanese Knotweed out there without us growing our own!! This article is written to promote discussion; free phone us on 0800 298 5424 to discuss any problems with Japanese Knotweed you may have with your property or house you are considering buying. OUR GOOD, BAD & UGLY SURVEYS! If you are in the process of buying a new home we would like to tell you about what we call our good, bad and ugly building survey. This is a Building Survey also sometimes known as a Structural Survey. We have developed this over many years, in fact several decades. We have listened to feedback from our clients and amended and altered our surveys to make them easy to read and describe issues clearly. The key factor we believe is our Independent Surveys are easy to understand and written in plain English.